Since 2014, StageCraft had been encouraging their students who are trained in public speaking skills, to get interested in theatre. Elizabeth A. Louis, the director and principal trainer of StageCraft, believes there’s no better way to show off their abilities than to present it in a live stage performance, usually at the end of each academic year. Elizabeth would encourage all the students aged between 7 and 17, to participate in various roles and let them perform live to an audience for an experience that will inevitably help them gain more confidence in public speaking. Following the success of last year’s presentation of A Tapestry of Malaysian Stories that featured a few well-loved Malaysian folk tales or Cerita-cerita Rakyat Malaysia, Stagecraft decided to have the second edition of A Tapestry of Malaysian Stories. Presented in black-box theatre style, the staging of A Tapestry of Malaysian Stories 2 was part of the programme of the 14th Johor Baru Arts Festival where an excerpt of the show was presented to the public Free-of-Charge, at Big Bites Café on Nov 18. In black box theatre, every actor was dressed in black and will have limited use of props, costumes and accessories so that the audience may stretch their imagination as they watch the performances. The full performance was held at the Setia Tropika Welcome Center, also known as the Setia Convention Arena, Taman Setia Tropika, in two ticketed shows on Nov 24 and 25. The programme of five short dramas and one choral speaking presentation was presented with a 15-minute intermission. This showcase of Malaysian stories aimed to bring together multi-ethnic children as they take on various roles, often as a character from a different ethnic group. The performance of the second edition of Malaysian Stories included original scripts written for Geng Kampung, Chicken Kapitan, The Silent Tiger (The legend of Bukit Gemai), The Pepper Parade and Manjal, the Tamil word for turmeric or kunyit. As I sat back to enjoy the show, I could see how some of the students took to the stage quite naturally and clearly enjoyed performing live to an audience. While the actors may only be students, they all did well but a special mention goes to the cook in the captain’s household in Chicken Kapitan. She realistically portrayed the role of an elderly Chinese lady whose language skills was limited and reminded us that most elderly Chinese who learnt a new language, often had problems with pronunciation. Her cooking skills may be commendable but her poor pronunciation probably resulted in how a dish like Chicken Kapitan earned its name! I observed how Elizabeth and her team of coaches made every effort to keep their scripts as close to history/legend as possible but took literary license to tweak the stories for the sake of continuity and brevity. The Pepper Parade is a catchy phrase but the Johor Chingay Parade is clearly more than that. I can understand how the name of this play was coined because the parade is a tradition of the Johor Gu Miao or Old Temple, the place of worship for the immigrant community of pepper and gambier planters. Through this play, StageCraft paid tribute to the Johor ruler whose wisdom and benevolence united the Chinese dialect groups through the ‘temple of unity,’ as a common place of worship. While pepper and gambier earned its place of honour in Johor, the Johor Chingay continues annually and in 2012, it was recognised as a National Cultural Heritage. Through Manjal, I learnt that it is the Tamil word for turmeric or kunyit. The show was also a lesson in Indian culture because interesting snippets were portrayed in the play and woven into the dialogue, in an attempt to educate the younger generation. One of the most ‘fun’ roles must be that of the son whose mischievous lines were a clever ploy not only to tickle but also to inform the audience. I must confess that I couldn’t help but laughed aloud when he gave his own (hilarious!) version of the purpose of the pottu, the Indian tradition of wearing a dot on the forehead, in particular when it was red in colour. Students as young as age seven are encouraged to participate in the performance because Elizabeth believes that stage experience is not only empowering and inclusive but also an opportunity to light the students’ passion for the performing arts. The youngest students received the loudest applause for their choral speaking presentation which they delivered to the best of their abilities. Groups of students came on stage to narrate their parts in Chimes of the Times, a choral speaking piece composed by Emelda Corea and Anne Louis, which described the disparity between the youngsters of today – also known as the fast-food generation – and those of yesteryears. When I heard words and phrases like ice-ball, gula tarek, chapteh and gasing spinning, I privately wondered if the current generation understood what each of these mean! I hope the students and youngsters in the audience may be intrigued enough to ask their parents and grandparents to clarify and in so doing, they may learn to appreciate some of the most popular treats and past-times in a bygone era. In past years, StageCraft have successfully staged popular children’s stories like The Gruffalo, Piglet – a parody of Shakespeare’s Hamlet, False Awakening – an original written by the students, a modern version of Cinderella and many more. StageCraft, which started in 2011 with some 40 students, has expanded to two centers located at Adda Heights and Nong Chik Riverside at Jalan Kolam Ayer. 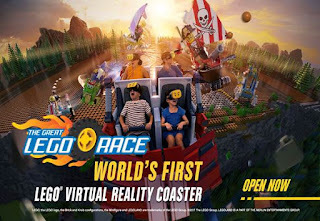 This morning, I arrive early to be among the first to pit my skills against five mini-figure competitors in the Great Lego Race, Legoland Malaysia Resort’s Virtual Reality Roller Coaster. I can understand how the park is chuffed at the launch of world’s first Lego Virtual Reality Roller Coaster ride and a never-seen-before in a Legoland theme park experience, in Legoland Malaysia Resort today. This is ahead of the Great Lego Race being launched in Legoland Florida Resort and Legoland Deutschland Resort in 2018. I’m familiar with Legoland Malaysia Resort – I was here at its ground-breaking and its first day opened to the media – and clearly remember the Project X rollercoaster, a ride situated close to the park entrance. I remember watching the cars way up there, as they precariously negotiate the winding tracks, designed some 18 meters above ground level. If I am nearby, I often hear the wailing screams of riders in the 4-passenger cars as they careen down the steep track at an agonizing speed. When I reach the event area for the launch of the Great Lego Race, I realise that the Great Lego Race will replace Project X in a unique way. If you are familiar with the thrills and spills of Project X, you will be happy to know that the entire experience of the Project X ride will be enhanced with the addition of Virtual Reality (VR) technology in an exciting new adventure. I’m excited to learn that the Great Lego Race will take riders into a unique Lego environment with the addition of characters, story-telling, action and humour. This is because the ride includes monitors that display side-by-side images of the physical rollercoaster track and the corresponding VR environment. For the full experience of being immersed in a completely new universe, guests are encouraged to ride the rollercoaster wearing the VR headset. Legoland working in partnership with Samsung, will give riders – both children and adults – a whole new experience where Bluetooth technology will sync the virtual visuals with the rollercoaster’s twists, turns, drops and climbs! As the crowd of privileged guests swelled, the excitement at the event area was palpable. All were grouped according to colour – five different shades of lanyards – to take our turns for the first experience of the Great Lego Race, in an orderly fashion. I watch as Legoland team members cordon off the area and redirect public guests through a path to the other side of the park. A guest stops to ask about joining the ride and I overhear a Legoland team member politely assuring him that he should be able to do so later when the ride opens to the public from 3pm. While waiting for the event to start, I get acquainted with the five mini-figures chosen to represent the way kids play with Lego toys, with no regard for rules, themes, characters or time periods. There is Pharaoh (2010) who rides an ornate canopied litter carried by mummified servants, Surfer Girl (2011) who rides a rocket-powered windsurfing rig, Pirate Captain (2012) who steers a dinghy with a turbine powered sail, Trendsetter (2013) who rides an espresso-fueled scooter with a sidecar for her tiny dog and Wizard (2014) who drives a dragon-themed hot-rod. The duration of the ride, I soon learn, is just three minutes so it’s good to be acquainted with the characters who should be whooshing by in the rollercoaster ride! I remind myself to keep my eyes wide open throughout the ride to recognise the mini-figure characters but in such a rollercoaster ride, I can’t be sure if I can keep my eyes open! In line with Legoland’s safety standards, guests below age 4 and stand 110cm in height, are not allowed on this ride. Guests must be above age 6 and 120cm tall to be allowed to ride alone. Legoland Malaysia Resort offers Johor residents an exclusive offer for an Annual Pass at up to 50% off. Pay as low as RM195 or top up RM125 for the Premium Annual Pass. This promotion can be purchased from Legoland Malaysia Resort’s ticketing counters and through its website. For more info on promotions and activities, visit Legoland Malaysia Resort’s official website: www.legoland.com.my and stay connected with the resort via social handles Facebook and Twitter. *Suffice to say that there’s nothing like a first-hand experience! Better get yours soon. It was a long-awaited and well-deserved award, one that was worth waiting for. In the 4th Iskandar Malaysia Social Heroes Awards (IMSHA) 2017, Tan Chai Puan, a renowned cultural activist in Johor, was recognised for his contributions with the Arts & Culture (Individual) Award. Upon receiving this prestigious award, the applause and compliments he received was loud and long simply because Tan was finally able to receive this award. Since the inauguration of the IMSHA three years ago, Tan’s wide contribution to Johor’s arts, culture and heritage scene was obvious. While he deserved the award in this particular category, he was not able to receive it for the simple reason that he was serving as a member of the IMSHA Leadership Council! This year, when he stepped down from his role in the Leadership Council, Tan was finally able to receive this long-awaited award. Over the years, I had the privilege of working with Tan, who is bi-lingual in Mandarin and English. His help was invaluable as it went a long way to give me a better understanding about the Chinese heritage in Johor. To most people, Tan is synonymous with the 24 Festive Drums because he and the late Tan Hooi Song, founded this dramatic art of drumming in 1988. Tan continues to actively promote this art of drumming through International Drum Festivals held every alternate year since 2010. In the past four festivals held in Johor Baru, local drum troops competed while international troops came to showcase their drumming skills. Early this year, when I was compiling the contents to publish my book, My Johor Stories: True Tales, Real People, Rich Heritage, I decided to feature Tan as an exclusive story under the Portraits section in my book. Involved with so many on-going projects, Tan was a busy man to pin down for an interview but we finally sat down for a chat on a sunny afternoon. I remember how Tan took out a large sheet of blank white paper and was poised with his pen to write. “Where do we begin?” I asked Tan, because he had such a wide involvement in Chinese culture and heritage activities. Using his pen on that blank sheet of paper, Tan started to share with me his life story, education and career and mapped out all the relevant events, years and activities to help me get a clearer picture of what he had done and was still doing in the arts and culture scene here and abroad. I cannot forget how Tan paused to tell me that in all the media coverage of the events he was involved in, not even one asked him to share his story. The coverage was always only about the events. I felt deeply honoured when Tan told me that I was the first with whom he was sharing his own life story. One thing which Tan told me – and which was deeply touching – was how his father, a first generation Teochew immigrant, worked hard for their family and the advice he gave to Tan about his career pursuits. And when his father passed away at age 72 in 1982, Tan composed a poignant poem dedicated to his father entitled, ‘The story of the luggage bag’ that chartered his journey as an immigrant. This vintage luggage bag that belonged to his father, is prominently displayed at the Johor Baru Chinese Heritage Museum, among the items that early immigrants used when they sailed from their homeland to seek their fortunes here. That night at the IMSHA Awards event, I joined the audience to clap, cheer and congratulate Tan on finally receiving his well-deserved award. Like me, many were overjoyed for him and kept him occupied with congratulatory handshakes and compliments. Finally, when Tan had a moment, he brought his trophy over to show me. I was deeply moved when Tan thanked me for sharing his story in my book, which he thought gave readers a clearer view of him, not only as a cultural activist but also a cultural initiator and innovator. Tan insisted that he must share the award with me (Thank you!!) and let me hold his trophy to capture a photo memento together. Congratulations Mr Tan, and many more awards to come! Note: In addition to MPH bookstores nationwide and on line via www.mphonline.com my book, My Johor Stories: True Tales, Real People, Rich Heritage, is also available at Borders and Kinokuniya in Kuala Lumpur. Seize this opportunity to watch talents like singer-songwriter Yuna and Johor’s own Plague of Happiness and Joe Flizzow, veteran artistes Sheila Majid, Zainal Abidin and the Alleycats brought to you live-in-concert, at Iskarnival 2017. 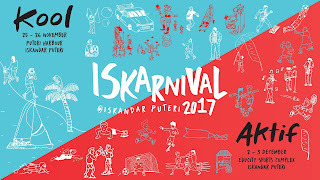 The sixth Iskarnival, jointly organised by Iskandar Investment Berhad, UEM Sunrise Berhad and Khazanah Nasional Berhad will celebrate the city status of Iskandar Puteri with double carnivals – Iskarnival Kool from Nov 25 to 26 and Iskarnival Aktif from Dec 2 to 3. Following the 10-year anniversary celebration of Iskandar Malaysia last year, Iskandar Puteri’s achievement of city status on Nov 22, marks another significant milestone this year. 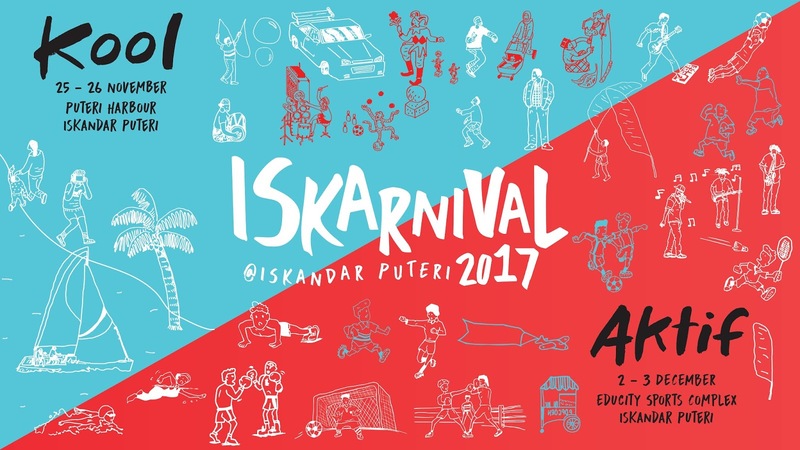 Happening over two weekends, Iskarnival 2017 will present a host of events for the whole family held in various venues in Iskandar Puteri, all Free-Of-Charge. The Johor-based arts and culture carnival will bring people together through youth and family-friendly entertainment, fun-filled activities and music, while attracting locals to experience the attractions in Iskandar Puteri. While Iskandar Puteri is fast-growing into a preferred destination for sports, education, lifestyle, investment and careers, the Educity Sports Complex provides world-class sports facilities for hosting international sports events and concerts. 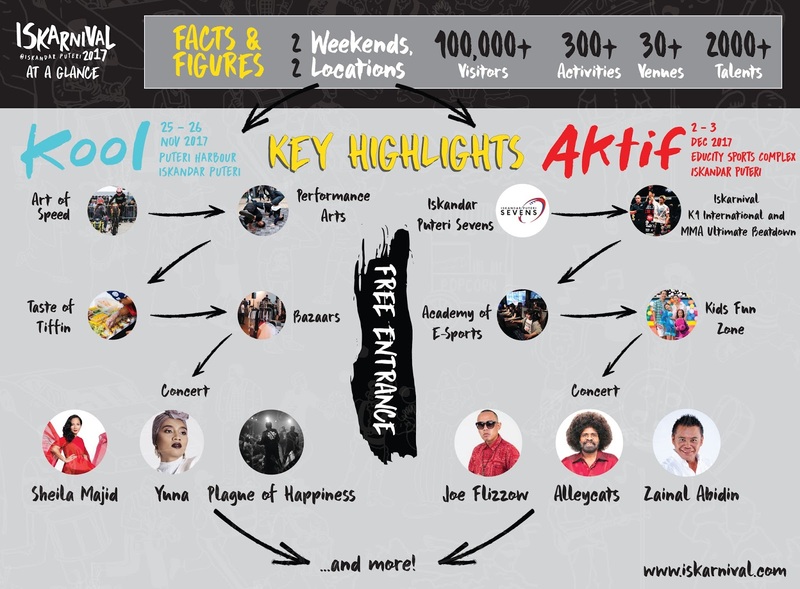 Iskarnival Kool, led by UEM Sunrise will highlight Malaysian pop culture and trends while Iskarnival Aktif, spearheaded by Iskandar Investment, will focus on sports and outdoor recreation. On the weekend of Nov 25 to 26, the events for Iskarnival Kool will be happening mainly at the Puteri Harbour promenade. Catch live musical performances by Los Angeles-based Yuna, local artiste, Sheila Majid, and the Plague of Happiness along with a programme of outdoor activities like Water Sports including fly-boarding, Giant Board Games and a Mini Spartan Race. A colourful bazaar on the promenade will also include a gourmet food bazaar dubbed a Taste of Tiffin. On the weekend of Dec 2 to 3, the events for Iskarnival Aktif will be held mainly at the Educity Sports Complex. This will feature the inaugural Iskandar Puteri Rugby Sevens Tournament, an international event organized by the Johor Rugby Union, which aims to become an annual event with a veteran category. Fans of kick-boxing can look forward to watching Iskarnival K1 International, a two-day competition that will showcase fighters from Brazil, America, Japan, Thailand and Malaysia. A half-day Mixed Martial Arts Tournament, consisting of 20 bouts, will also be held in the indoor stadium. E-Sports enthusiasts can look forward to taking part in a Mini Tournament hosted by the Academy of E-Sports which brings partners together to educate and offer career opportunities in the E-Sports industry. 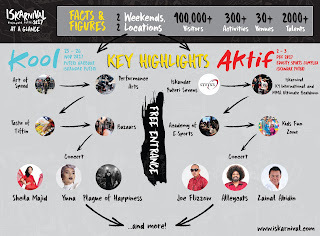 To top-off the exciting events in Iskarnival Aktif, watch live concerts by local artistes Zainal Abidin, Joe Flizzow and the Alleycats. Best of all, admission to all events is Free-Of-Charge. Today, Nov 16, I discovered that I-K-E-A are the initials of its founder’s name, his family’s farm and the village where he grew up in Sweden – Ingvar Kamprad Elmtaryd Agunnaryd. 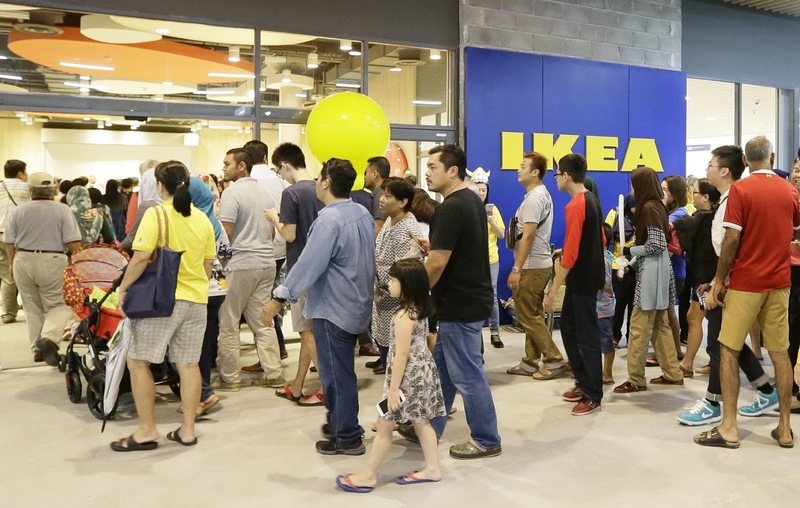 On Nov 16 at exactly 10am, IKEA’s first store in Southern Malaysia that covers 46,713 square meters of floor space, welcomed shoppers into IKEA Tebrau, its biggest store in Southeast Asia. In the past few months, I passed the site and saw the building gradually taking shape, heard rumours that this brand was soon opening here and recently, I finally saw for myself, that iconic logo which confirmed all the hearsay. And for fans of IKEA, this became a serious countdown to its opening date. All who have been enjoying the shopping experience at its outlets in Singapore, Kuala Lumpur and elsewhere, can now look forward to shopping at an outlet literally in our own backyard! With all the hype spreading on social media, fans and shoppers in Johor Baru were buzzing with eager anticipation, just waiting for its doors to be opened on Nov 16. 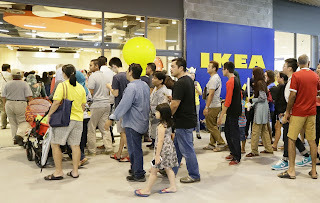 Closer to its opening date, IKEA Tebrau sent out teams of their co-workers riding on bicycles and walking about wearing backpack billboards to inform and invite shoppers into their store. Some fans, eager to catch the proverbial fattest worm along with chances to win prizes, started to queue up at the store from 11.30pm the night before so as to be among the first people to step into the store when it opened at 10am the next morning! Meanwhile I had the privilege of a media invitation for Nov 16 with specific instructions on where to park and what time to get in to join the IKEA team and other guests for a Swedish breakfast before the official opening formalities started. Waking up at the crack of dawn for this event was surreal but driving into the carpark and finding it looking like an exact replica of its other stores, was a comfortable and familiar feeling. I saw young men wearing IKEA blue waistcoats embroidered with white flowers against white shirts and young ladies wearing IKEA blue Swedish peasant dresses with long skirts and matching flower garland headbands. They checked my invitation [on my phone!] and guided me to the second level where I was welcomed into the restaurant which was already a hive of activity. Guests were eating their Swedish breakfasts and when I approached the serving staff, I was told to sit down and they will serve it to me. As the tray was served, I glanced at the bowl of cereal and yogurt, a slice of bread and crackers with cheese slices and smiled when my eyes fell upon the Swedish meatballs topped with cranberry sauce, a signature item at the IKEA restaurant. A sliced hardboiled egg and a slice of smoked salmon on a tiny bed of potato salad were served on a separate saucer. Needless to say, I started my breakfast by eating the portion of meatballs first! The event Master of Ceremony was giving a series of announcements to brief us on the event programme and its timings, and he kindly assured me that I had plenty of time to enjoy my breakfast before the speeches started. He reminded us that after the speeches, the entire event would move to the Ground level for the official opening ceremony. In his speech, IKEA Southeast Asia managing director, Christian Rojkjaer, expressed his appreciation to the team of over 300 local co-workers and was grateful for their Johor boleh! attitude. He said that their IKEA store, a one-stop family shopping destination, was like a living organism where there was always something to do here. IKEA Tebrau is now official declared open! Among other things, IKEA Southeast Asia retail director, Mike King, said that IKEA Tebrau aims to inspire people to turn their houses into homes. IKEA Tebrau store manager, Annie Chandler, was excited with the solutions that they can provide. She commended the planning team for doing an amazing job in preparing the store for its opening and said what they had done was the most inspiring arrangements she had ever seen. In her 14 months in Malaysia, Annie who’s Australian, was impressed with the 300 local co-workers and their positive can-do attitude. When the deputy store manager, Charles Sathis Nair, was introduced, I felt a ridiculous sense of pride because Charles is also a Johorean! Then Charles commented that it was “a momentous day today” and it resonated within me because this was the exact word I used to describe my year this year! Keeping a close watch on the time, the MC then invited the media to first move to the event area downstairs, followed by others who should take their places for the official opening gimmick. Instead of cutting a ribbon, IKEA has a tradition in sawing a log in two, symbolic of a new beginning and the stage in the event area, was set up for this. It was like a photography frenzy as cameras of various kinds clicked or videoed the moments as they watched the VIPs sawing the log with all their might on the stage and (flashed) on the LED screen. It took a while but with some cheering encouragement, they finally sawed the log in two! Then a short video was screened to showcase how the IKEA co-workers on bicycles and walking billboards reached out to the community in and around Johor Baru. Once the video ended, the stars of the video – the bikers and walking billboards – rode/walked into the event area amid claps and cheers. When the special performance was announced, I felt another surge of pride as the girls from the Sultan Ibrahim Girls School (SIGS) Marching Band struck up the chords and marched smartly onto the stage, complete with members of the colour guard bearing IKEA flags! The MC got it right when he called the band, “the pride of Johor Baru” because last year, I had the privilege of meeting them and doing a feature on this award-winning all-girls band. Then it was time for an advance 30-minute peek into the store before the ‘floodgates’ were opened. Walking in behind the VIPs, I was among the first to step into IKEA Tebrau to experience the exciting displays in the 54 room sets and admire over 8,000 types of products in the store. As I browsed around, I grooved to the upbeat music played on the store’s sound system just soaking in the IKEA feel – if there’s such a thing – still not quite believing that all this was happening in JB! At about 10 minutes before 10am, the music paused and a voice made an announcement, addressing the store’s co-workers, advising them to be at their respective stations as the store would be opening in about five minutes. Little did I know that a mighty crowd of thousands of shoppers were queuing up outside while another group was safely corralled behind bars in the covered carpark, just waiting for the doors to open at 10am sharp. “Where did these people come from?” I wondered. “Didn’t they have to go to work?” I asked myself. Then I recalled my friend Edey telling me that in his wife’s office, two of her colleagues took the day off just to go to IKEA Tebrau! I imagined many employers being shorthanded today as they discover staff being absent from work, simply because IKEA Tebrau was opening its doors. Operating hours at IKEA Tebrau are: Sunday to Thursday from 10am to 10pm, Friday and Saturday, public holidays, eve of public holidays and replacement holidays that fall on Mondays, from 10am to 11pm. For more info on Opening promotions/activities and limited edition deals, visit website: IKEA.my/Tebrau. With the year-end holidays just around the corner, it’s time to plan some quality time with the family and there’s no better way than to bond over animal attractions at Singapore’s award-winning nature parks – Singapore Zoo, River Safari, Jurong Bird Park and Night Safari. 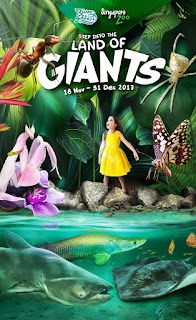 There is plenty to see and do, so plan to spend a day at the Land of Giants in Singapore Zoo and River Safari for some super-sized fun. Then end the day with Twilight Encounters at the Night Safari. Get to know the amazing abilities of insects at Singapore Zoo and the majestic river giants at River Safari through interesting activities held every weekend from Nov 18 to Dec 31. 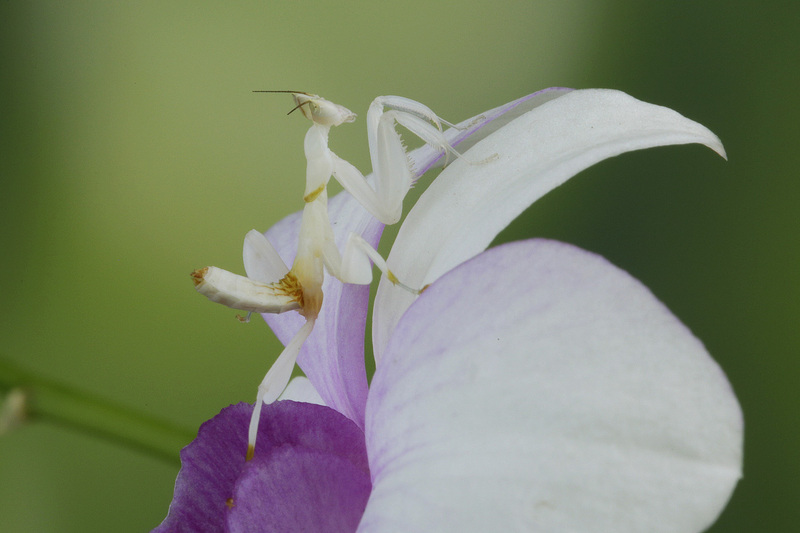 The Land of Giants features 20 larger-than-life invertebrates (animals without backbones) including the orchid mantis and net-casting spiders. Let the youngsters follow the ant trail for different activity pit stops and enjoy fun stuff like creating a creepy crawler, watching a puppetry performance or spying on some invertebrates through the bug magnifier! Over at River Safari, embark on a super-sized edition of River Trails and discover gigantic facts about river dwellers like the Mekong giant catfish and giant freshwater stingray. Then at the River Talk, get ready to meet one of the largest flying birds and the world’s largest rodent! As night falls, take the family on a wild night out at Night Safari to experience Twilight Encounters which includes a mystical glow-in-the-dark trail to find animal lights among the real creatures of the night. Discover the secrets of the glowing trails and stand to win attractive prizes. Look out for special animal appearances by nocturnal creatures like the binturong and watch how Night Safari’s animal residents display their natural skills in exciting animal shows. Activities are held at various park locations on Fridays and Saturdays, from Nov 17 to Dec 31. 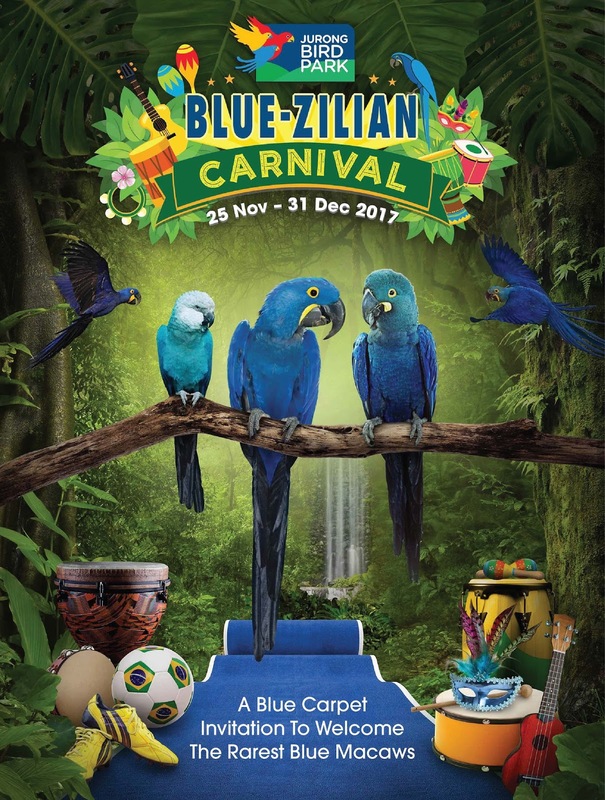 Then plan another day to join the Blue-Zilian Carnival at Jurong Bird Park to see the world’s rarest blue macaws, including the Spix’s macaw, the blue bird which inspired the Rio movie series. If you plan to go on Nov 25, extend your stay to watch the screening of the first Rio movie at the amphitheater. Native to Brazil, the critically endangered Spix’s macaw and endangered Lear’s macaw are making their inaugural appearance at the park’s Parrot Paradise exhibit. Together with Jurong Bird Park’s Hyacinth macaw, they make up the entire remaining blue macaw family. The fourth and final blue macaw species – the Glaucous macaw – is already extinct. 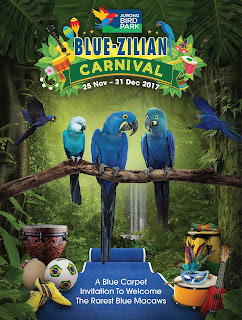 Experience a bit of Brazil, the native habitat of these blue beauties and be captivated by Capoeira, a Brazilian martial art form that combines music, dance and acrobatics. The Blue theme continues at the park’s food and beverage kiosks which serve specialties like Blue Blue Cha Cha and Butterfly Pea Flower tea. Bring your cameras (phone cameras will do!) to capture special mementoes with the parks’ mascots. Look out for the giant dung beetle (and his ball of dung) and the lime butterfly at Singapore Zoo as well as Canola the manatee at River Safari. Also grab a wild shot with the animal stars to remember your wild night out at Night Safari.